In the two years since the EU’s inhumane deal with Turkey, the plight of traumatised refugees arriving on the Greek islands has worsened significantly. Instead of refuge, they are being offered prison. It has been seven years since the conflict in Syria erupted and two years since the Balkan refugee route was shut down and the EU-Turkey deal to return refugees arriving in Greece to Turkey was set in motion, which have led to a severe worsening of the plight of refugees and migrants. Last August, when the Greek authorities succumbed to pressure from Brussels and took on a number of duties previously performed by various NGOs and solidarity initiatives, the conditions on the ground have reached new lows. As things stand, some 13,000 people remain trapped on the Aegean Islands, mostly in what used to be called ‘hotspots‘ but have now been euphemistically re-branded to become ‘reception centres’. A further 30,000 are still stranded on the mainland, many of them for two years or longer. The Greek authorities have been efficient at guzzling up the European funds pouring in as payment for having turned the country into a buffer against all comers. But when it comes to the actual aid received by the refugees and the migrants, Greece has distinguished itself as slow, sloppy and often completely unresponsive. The fate of tens of thousands has, thus, been handed over to an incompetent bureaucratic machine, whose main purpose seems to be stalling things to a standstill. Its second objective is to repel the ‘invaders’ massing at the borders. But the refugees and migrants keep pushing in. Owing to the horrendously escalated situation in Syria and the Turkish crackdown on Kurds in Afrin, a substantial mass of people is again making its way to the Aegean Islands. As for Turkey … Well, that destination is currently safe only for the loyal supporters of President Recep Tayyip Erdoğan and his authoritarian policies. “If you’re waiting to die, you can just as safely do that in Syria,” Majd Tabhet, 24, said with a rueful grin. At a glance, it was clear that the articulate and urbane young man had grown highly adept at masking his pain. After a few hours of conversation – actually a monologue – I was left with the burning question: how was it possible for this young man, who had undergone all the dehumanising savagery of European anti-refugee policies, to retain his basic sanity? And how could he still bear to look into anyone’s eyes without lashing out? Majd, from Damascus, left his homeland in the wake of the first year of war. On receiving his conscription notice, he realised he that he was absolutely against taking up arms. He preferred to risk everything than to start butchering his friends, colleagues and neighbours, yet he still could not quite bring himself to believe the country had degenerated into all-out war. “You see, my life was barely starting,” he shrugged helplessly, during our conversation at a social centre on Samos run by volunteers from all over the globe. Prior to the escalation, Majd had been following the developments in Tunisia, Egypt and Libya. He had been listening in on his elders’ talk, and many of them had been foretelling the tragedy. It seemed obvious to Majd that pent-up hatred was boiling on every doorstep. Unfortunately, the regime had been prepared for the ensuing wave of protests. And Bashar al-Assad proved highly skilled at learning from his fellow tyrants’ missteps. Majd’s conscription into the state military was followed by a very similar ‘invitation’ to join the ranks of the Free Syrian Army (FSA). Fortunately, the young man had already applied for the post of a steward with a Saudi charter jet company. He hadn’t exactly held high hopes of getting the job, but his perfect English and his innate resourcefulness and charm had apparently made an impression on his future employers. Instead of to the barracks and the frontline, he was relocated high above to the Asian sky. “I was so relieved. I managed to avoid the slaughter. And it was a good job, you know. But I simply couldn’t adjust to life in Saudi Arabia. Being a moderate Muslim, I found pretty much all of it alien, intrusive, unnatural and just plain weird. Everything there revolves around faith and countless ‘special rules’ one never heard of in Syria. I must confess it had a very repelling effect on me. My ideas about Islam were beginning to crumble. I was tumbling into an identity crisis. My personality was beginning to split,” Majd recalled. As had been the case with thousands of his fellow refugees, his asylum application had been twice rejected by the Greek authorities. His current fate was to await deportation to Turkey, according to the provisions of the EU-Turkey deal. 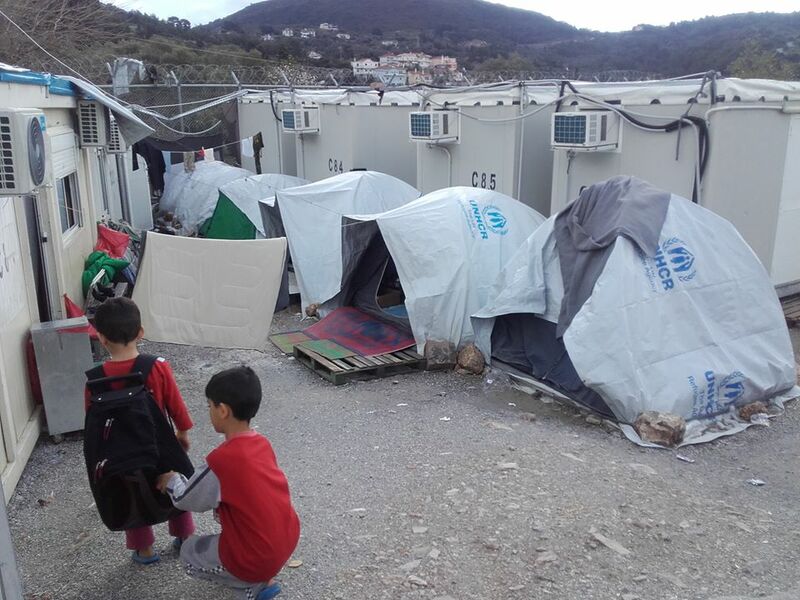 Majd has spent most of his stay on the island at the infamous Vathy refugee camp, where the living standards are even worse than those at the similar hot-spots on Lesbos and Chios. On the day we met, two days of incessant rain had finally let up. For a long while now, no journalists had been allowed into these hellholes of human misery. But I managed to enter Vathy with the help of a group of residents, who didn’t need much to persuade me of the outrageousness of their situation. The camp itself had been set up on a slope above the island’s capital. A muddy creek was running down the steep incline forming the ground floor, with drying laundry hanging off the ubiquitous barbed wire. A thin, knock-kneed boy was sitting in the mud and eating what remained of his breakfast. Suddenly, a rat shot by. It was a far from uncommon sight. The camp was riddled with vermin. But for the most part, this was the least of the refugees’ concerns. On some days, the camp’s residents needed to queue for up to two hours to get fed. Their tents were so thin they were only suited for warm and dry summer nights. In the camp’s upper section, where the unaccompanied children were being housed, the ground was strewn with broken glass and all possible kinds of refuse. The boys and the young men were simply left to fend for themselves. A gag-inducing reek was blowing in from what could only charitably be described as toilet facilities. Many of the families here were spending most of their time hiding inside the containers. The campsite was simply not safe, especially for women. Here, sexual violence has long become the norm. Alcohol, drugs and vicious brawls are abundant. Many of the camp’s traumatised and thoroughly humiliated inmates were finally beginning to lose their patience. Their anger was primarily directed at the continent of Europe, whose bureaucrats had seemingly solved the refugee problem by turning it into a life-sized Raft of the Medusa. In 2015, three years after Majd arrived in Saudi Arabia, all the Syrian employees in Saudi companies were notified they were to return to their homeland. Syria and Saudi Arabia had severed all contact. Majd had ten days to decide on his next destination. All he knew for certain was that he would not be returning to Syria. Had he been foolish enough to do so, he would have been jailed – either by the government or by the rebels. During his three-year stint abroad, both regime troops and rebel soldiers had repeatedly visited his family to look for him. Given that Majd only possessed a Syrian passport, he was not exactly spoiled for choice. So he flew to Turkey. He had managed to save up some money, but he was painfully aware that he would be unable to go home for a long time. He rented a room in a house in Istanbul, where 22 other Syrians were already residing. Many of them had just recently arrived straight from the battlefield. They were exhausted and traumatised veteran soldiers. Many of them had also been thoroughly radicalised. Having already turned his back on Islam, Majd found their company exceedingly unpleasant. Since so few of them had work, they spent their empty hours preaching their religious and political doctrines to him. Through his connections he managed to land a well-paid job with a private company specialising in airplane rentals. During this period, bombs started crashing down on the section of Damascus where Majd’s family lived. Tanks were invading the outskirts of his neighbourhood. It was the first half of 2015, when countless thousands of Syrian refugees had already struck off for the Aegean islands and beyond … hoping to reach Germany and northern Europe. Majd’s family – father, mother, brother, sister – decided to flee for Turkey. They arrived virtually penniless. For the period he remained in Turkey, it fell to Majd to support them. They were barely scraping by. Throughout this period, the serious and introspective young man kept exploring Christianity and ‘seeking out a new way’. Following his visit to a small Orthodox church on the outskirts of Istanbul, a gang of young men beat him for being an ‘infidel’. At the hospital where he was taken afterwards, he was questioned by the police. The Turkish policemen added a number of their own threats to the bargain. Majd no longer felt safe in Turkey. He knew he needed to push on to anywhere in the European Union, which he thought of as the Land of Freedom and Democracy – anywhere he could freely exercise his religious beliefs and address as many complex issues as he pleased. “Well, I couldn’t have been more wrong about Europe,” he confessed 18 months after his arrival in Samos, speaking in a quiet, weary, all but defeated tone. “European refugee policy, and especially the conditions at the reception centres, is stripping the refugees of all dignity. 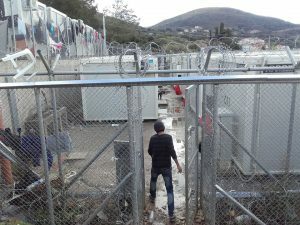 They are being treated as a homogeneous mass, instead of as human beings, instead of as individuals with unique fates,” Aliki Meimaridou, the woman in charge of a Samos refugee mental-health support project run by Médecins sans Frontières (MSF). Majd Tabhet arrived in Greece on 11 October 2016, just over six months after the so-called Balkan refugee route was shut off. Although Majd knew he was too late, he crossed into Greece anyway because staying in Turkey was growing too dangerous. And on that very first night, he was promptly caught and beaten by the island’s police. This left him thoroughly confused, which he remains to this day, in spite of all his subsequent dismal dealings with the Greek bureaucracy. His suffering, however, had gradually delivered him from all his illusions and expectations. Majd tried to manage as best as he could. He co-operated with the local solidarity movement and the various NGOs. He put in many hours as a translator. He helped out the stream of refugees arriving at the island. He sought out a local orthodox priest and informed him of his plight. The priest lost little time initiating him into the faith. For Majd, Islam was now firmly consigned to the past, and he started learning about the rituals and the basic tenets of the Orthodox church. Soon after, he was baptised. He arrived at his first asylum interview with a broken nose. The previous day, he had been roughed up by a band of refugees who saw him emerging from the church. After a five month wait, his application was turned down. A local lawyer helped him formulate an appeal. But it got turned down as well. Majd’s status as a single young male had stripped him of most of his chances. The first time he was turned down, Majd was shocked. The second time his entire world came crashing down. “All I wanted was to be safe,” he told me with tears in his eyes. Majd had by then realised he was to be deported. He was sharing a tiny tent with two and sometimes three companions in a chaotic and very dangerous camp. The camp’s official capacity was 700 people, but it was currently housing at least 1,500. Last August and September, as many as 2,200 were crammed there in absolutely savage conditions. And fresh refugees were arriving all the time. Every other day, a fresh boatload of them was delivered to Samos. The situation on the other Aegean Islands was much the same. The UNHCR spokesperson Boris Cheshirkov confirms that recent months has seen a steady flow of vulnerable refugees into Greece: “Roughly 40% of those arriving in this last period are children. Many of them are parentless. There has also been an increase in invalids among the new arrivals. The situation is extremely sensitive.” Cheshirkov also drew the attention to the severe overcrowding and catastrophic conditions at the reception centres on the islands, especially on Lesbos and Samos. The most vulnerable refugees are being transferred to the mainland. “The reception centres have become a dangerous environment for women. There is very little oversight of what goes on. Sexual violence is on the rise. We at the UNHCR have recently pointed all this out in our official report,” he explains. To avoid deportation, Majd Tabhet accepted his Orthodox priest’s offer to move in to the monastery for a while. But he knew he would not be able to hide for long. After a few weeks, he was apprehended by the police. This was during last autumn. Majd was immediately put in a small detention cell at the local police station. Over the next few months, he was to share the cubicle with all sorts of criminals and a number of fellow refugees. It marked the beginning of the worst hundred days of his life. Several times, Majd was convinced he was losing his mind. It felt like he was constantly fending off demons. He refused to be put on antidepressants or any other kind of medicine. He was subjected to the vagaries of his various cellmates’ fates. Apart from them, he was completely cut off from the world. His lawyer could not – or would not – help. The humanitarian workers were powerless, as they themselves were exposed to increased regulation from Brussels and Athens. For a hundred days, Majd did not see the light of day. There was no room to exercise in the overcrowded prison. Sleep was very hard to come by. Hygiene was horrendous, to put it mildly. The food was a disaster as well. Twice, the Syrian convert was transported to a different location. At one of those two detention facilities, the cell he shared with three Algerian men was constantly illuminated by a bright red light. It was pure torture. Then, one morning, Majd simply collapsed. He was taken to a hospital to run some tests. Upon reading the results, the attending doctor announced that sugar levels in his blood were in the potentially lethal range. She gave the policeman who brought him a good talking to. Then she wrote a recommendation that Majd should be released immediately. On any given day now, Majd runs the risk of being approached on the street by police officers who could either send him off to Turkey or imprison him again. By this point, he wouldn’t mind returning to Turkey that much, he admitted. The crestfallen refugee couldn’t find a single reason to sustain his faith in Europe. His life melting away, every day here seemed lost to him. Seeing that he was obviously running out of energy, it was little wonder his days were getting shorter and shorter. All he felt like doing was sleeping. Majida Ali, 41, hails from the vicinity of the besieged Eastern Ghouta. She spent years suffering in both regime and rebel prisons, where her body and soul were stolen from her. Utterly ruined, she eventually managed to flee to Greece through Turkey. Once she arrived, she was forced to face the entire spectrum of local bureaucratic savagery. Before the war broke out, Majida was living some of the best years of her life. After completing her degree in economics and political science, she started a wedding planning company, which became a huge success in Damascus. For a time, Majida was able enjoy the finer things in life, turning herself into a minor celebrity in the process. That last part was to prove the engine of her undoing. In the spring of 2011 war broke out. Majida had grown up in a military family: her late father had been a high-ranking officer in the Syrian army. Owing to her tremendous respect for the army, she refused to give credence to the reports of regime atrocities against protesters. She was also unable to believe the news of the sudden emergence of foreign fighters is some parts of Damascus. No, she firmly told herself: such a thing was simply impossible in the Syria she knew. So she took to the streets to establish what was actually going on. She took many pictures of the protests and the first tanks rolling through the streets of her home town. Frantically darting her way through the initial shoot-outs and bombings, she took in the first heaps of corpses. It took a few weeks for the last of her illusions to crumble. What she found hardest to grasp was how perfectly ordinary people could overnight morph into cold-blooded killers… And how easily the old, repressed hatreds could be catalysed into outbreaks of collective lunacy. Eight years later, no end to the lunacy is in sight. Turning herself into a citizen-journalist, Majida set out to document the various forms of violence erupting around her. Then her friends and relatives started disappearing. After a few months, she was arrested by government soldiers. On account of the photographs found on her camera’s memory card, she was immediately jailed. For a month she was beaten and tortured. She became the victim of several sexual assaults. She could see people dying all around her from the wounds sustained through torture. Majida eventually managed to secure her release from the government prison by drawing on her family’s connections. She knew very well she could not remain home. She wandered all over Syria: writing, taking photos and reinventing herself as she went along. It wasn’t long before she was apprehended by the members of the Free Syrian Army (FSA). At first, she believed their intentions were honourable. But she was wrong. She was accused of collaborating with the regime and thrown into an improvised jail cell. There, the whole sordid tale of the regime prison repeated itself, until, as she puts it, the woman in her was eviscerated. Before her final escape from the war-torn land, she was again imprisoned by the regime. This time, she was convinced she would not make it. The authorities had actually notified her family that she was dead. What remained of her relatives even held a symbolic funeral for her. After all the violence and suffering, Majida finally lost the connection to her soul. Her connection with the outside world had been broken long ago. On 17 March 2016, she was released. The help of friends got her first to Turkey, and then two weeks later, here, to Greece. But she was too late. The Balkan corridor had been welded shut. Throughout our conversation, she kept flicking anxious glances at her cell phone. She was perpetually terrified of receiving a call from Eastern Ghouta and the Damascan quarters that had been bombed hard over the past few weeks. Ten days earlier, the regime bombardment had cost her another sister. Altogether, she had lost 45 relatives in the Syrian war. Her three brothers were currently held in three different prisons. She had no clear confirmation they were even still alive. Her gravest fears concerned her mother, who, after the bombs had flattened the family home, had moved to a safer part of Damascus where she now spends her days preparing meals for four hundred people. Their refugee status is nothing new for Majida Ali’s family. Her grandfather had been a reputable Palestinian businessman. Fleeing Israeli violence, he left the country in 1949. He bought a large plot of land on the outskirts of Damascus and built housing for numerous Palestinian families. For five months Majida had been residing at Vathy, a 21st-century concentration camp and one of Europe’s human landfills. Once more utterly alone, she was again exposed to sexual harassment. It was her first contact with the continent of Europe: danger instead of safety, prison instead of aid, humiliation in place of dignity; bureaucracy masquerading as justice. It took 14 months after she filed her application for the first official interview to take place. When we took a stroll around the island, Majida was cordially greeted by every other person we passed. During the two years she has spent on Samos, she has taken an active part in the local community, even if that community was so conservative it first refused to accept that Majida was still wearing a headscarf. But things have changed. The derogatory remarks were much rarer now, and as for threats, they all but vanished. For the past few months, Majida had been employed at the Help Now NGO, where she specialises in helping refugees. The people here have got used to her, and she has grown accustomed to them. Her wish was simply to live, she added. But not on charity – never charity. She has consistently refused any form of monetary aid. Her aim is to live exclusively off her own labour. Until now, she has been successful at the task. Her driving force has become helping out her traumatised peers. She has no intention of returning to her homeland, now or ever. Her Syria no longer exists. Perhaps it never had. Perhaps it had all just been a big illusion, a sordid lie. In fact, this interpretation struck her as the most plausible. How could she otherwise explain that it all ended in such slaughter?